How can academic teaching and learning be shaped in conformity with recent reforms in higher education and education policy? What role could digital media play in implementing research-oriented concepts? If you ask yourself questions like these, you will quickly find a wide range of existing concepts and approaches in institutions of higher learning and grapple with a vast number of scholarly and practice-oriented publications in Europe and the U.S. (Hillen and Landis 2014). The current challenges range from adequate spatial or technical infrastructure, e.g., the open accessibility of information and knowledge in libraries to the individual critical handling of technological developments, to name but a few. These challenges are more likely to arise due to a more open and largely problem-oriented form of teaching, and are not necessarily related to the use of digital media. 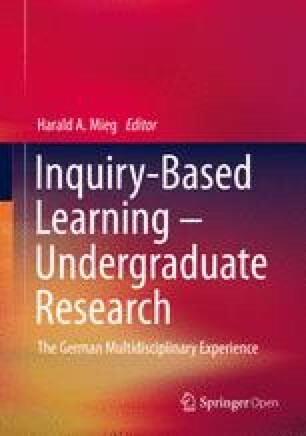 How, for example, do students manage to pursue their own (research) questions during their studies and throughout their studies? Are there any new opportunities for implementing research-oriented teaching or inquiry-based learning through the use of digital media?